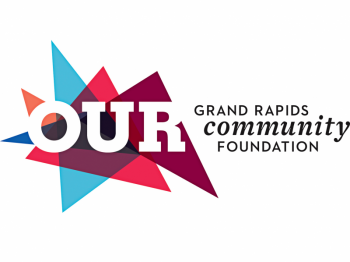 A new show is coming to the Grand Rapids Public Museum’s Chaffee Planetarium beginning Saturday, June 16, 2018. The show, Space School, features astronauts training underwater for working in space. The show will begin in conjunction with the Museum’s summer traveling exhibition – Be the Astronaut. Space School will provide a rare glimpse of NASA astronauts training for walking and working in space by spending time in underwater environments here on Earth to learn how to manage and work in the microgravity of space. See a breathtaking close up view of astronauts training for what promises to be the greatest of human adventures - traveling to distant planets and exploring other worlds - in our continuing effort to discover who we are and where we came from. Be the Astronaut traveling exhibit explores the challenges and excitement of space flight! Also opening June 16, visitors take command of futuristic space vehicles, chart their course to the Moon, Mars and beyond and land and explore highly detailed digital re-creations of actual places in the solar system built using data from NASA space probes. The experience is scientifically verified by experts at NASA for accuracy and feasibility. Space School is a documentary-style show and will be part of the regular show schedule starting Saturday, June 16, 2018. Planetarium shows are $4 with general admission and $5 for planetarium only. Museum members receive free admission to planetarium shows. Filmmaker Jonathan Bird, host of the syndicated Public Television series Jonathan Bird’s Blue World, shot the film for projection in full dome theaters using the latest technology from RED, the ultra-high-definition 6K RED Dragon. With the cooperation of NASA, Bird and his team filmed astronaut Chris Cassidy training for space walks at the Neutral Buoyancy Lab in Houston, and astronaut Jeannette Epps practicing techniques for exploring distant asteroids and planets at the Aquarius Reef Base in Florida. 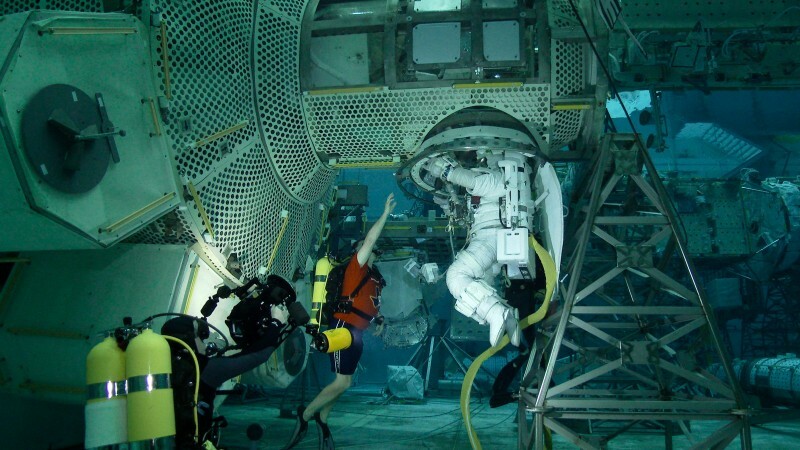 At the Neutral Buoyancy Lab in Houston, Cassidy and fellow astronaut Jeff Williams are lowered into a giant pool while wearing a full size space suit, breathing through an umbilical tube, as they would in space. Divers adjust each astronaut’s weight so they achieve neutral buoyancy inside the pool. Here they practice repairs to the International Space Station on life size mockups. Working in this environment, astronauts can practice maneuvering in their awkward space suits using the same tools they would use during an actual spacewalk, anchoring themselves, as they must in space to gain leverage and prevent themselves from floating away. In Florida, Jeannette Epps spends over a week living with other astronauts in the Aquarius Reef Base. Here astronauts learn to live together in isolation for long periods of time, a requirement of space missions. At Aquarius the astronauts practice going on excursions and use specially designed drills to gather soil and rock samples, practicing methods required to explore distant planets and asteroids. Aquarius is like a space mission in another important respect. Astronauts cannot simply leave and go home when they want. The reason, in the underwater environment, is a phenomenon called nitrogen saturation. After just a few hours underwater, the astronaut’s blood becomes saturated with nitrogen held there by water pressure. If the astronauts were to suddenly go to the surface where the pressure is less, the nitrogen would come bubbling out of their system to disastrous consequences. To safely make it to the surface, divers must be slowly decompressed to allow the nitrogen to dissipate. Space School is among the first digitally-filmed live action dome format films. The RED Dragon is the first commercial camera to offer high-resolution images suitable for projection on a dome. The film was also shot at 60 frames per second, more than twice the frame rate of conventional film, creating an amazingly life-like experience. “Live action in the dome format at a high frame rate is just like being there,” says filmmaker Bird. The film is distributed by Sky-Skan, the world’s largest full dome film distributor. Be the Astronaut teaches STEM based content via a fusion of physical exhibitry and state-of-the-art video game technology. Visitors will have their own crew of virtual content experts throughout every stage of the exhibit. These digital characters will help visitors learn what’s needed to fly a spaceship, pilot a lander, and drive a surface rover — then will be there as visitors climb in the simulators to actually perform these feats, in a thrilling narrative adventure that spans the solar system.